As we are a launchpad for fledgling businesses, not all our stockists have websites, yet! We also order in items from larger manufacturers but source as locally as we can and always within the UK. Our largest gift supplier is in Swansea! ​So who do we have? You can also find personalised items and gift ideas not found in store here. 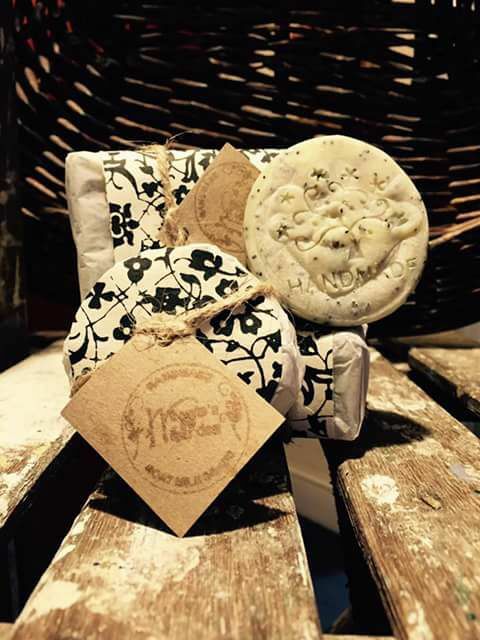 Maggies Garden Goat Milk Soaps is our main source of beauty products. You would have no idea that these all natural sumptuous Soaps and Body Butters were handmade in a little Cardiff kitchen. Naturally Cruelty and Palm Oil free and never tested on animals. Available in many scents such as Ylang Ylang, Coconut, Warm Vanilla, Lemongrass and Chamomile & Rosemary as Soaps or Body Butters infused with a little goats milk to add extra creaminess. ​There is also an option to create a perfect gift set in a little jute bag. Mix and match with a body butter and soap or soap duos or trios. Tester pots are available for you to try the silky smooth goodness. ​The art of Chainmaille was originally used for armour and by linking many rings, often hundreds, it is now being used to create fantastic, bespoke jewellery. Using jewellery grade aluminium rings it is light weight, doesn't tarnish and is often suitable for those who have allergies. 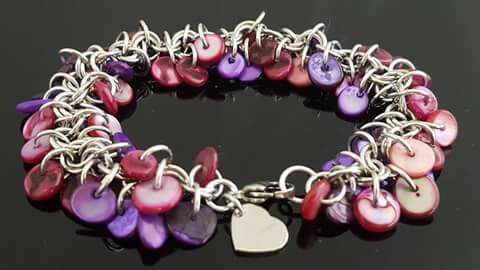 We have bracelets, earrings, necklaces and keyrings available instore. Becky's Creations offers something completely different and ultimately funky and quirky. A talented artist with fimo clay, she handmakes each pendant with intricate detail. Offering too many designs to list she often embellishes with genuine swarovski or naturally formed crystals such as labradorite or quartz. From Unicorn horns, Butterfly Wing Bag Charms to Glass Centered Flowers and Glow in the dark Day of The Dead Sugar Skull pendants there is a one-of-a-kind piece that is guaranteed to be a talking point in your circle. Choices of leather type adjustable thong, silver plated link or snake chains are available with your purchase as well as a handmade mini gift bag of your choosing. Is the perfect 'go to' gift for a new mum or baby shower. 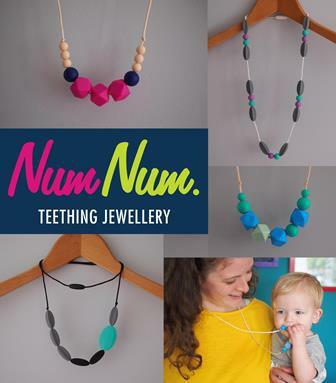 It offers mum safe and stylish jewellery that won't be damaged by, or damaging to, baby. Made with food grade silicone they are perfect for teething babas and simple to clean and sterilise. Ideal for breast feeding or baby wearing mums to wear as fiddle necklaces too...Saves all the hair pulling! Mum made in the UK by the lovely Jen and recommended by the Eclectica mascot (she picked her own!) we are proud to announce that at the time of writing we are the ONLY stockist in the whole of WALES! Many designs and colour combinations available. Amber Faye is truly an inspiration. Nominated for a Pembrokeshire Young Entreprenuer of the Year 2017 award having set up her Soya Wax business at the age of 14! She uses Soya wax as it burns evenly with little soot as well as being the natural and eco friendly alternative. Loaded with scent and beautifully packaged there is also an incentive scheme to return your tins for refilling. Curtis Allen is a talented, published, freelance Illustrator and Artist from Birmingham, now living in Leeds. He is responsible for the creation of the steampunk 'Coggington' characters which adorn his cards and other artwork. He is available for any type of publication and sells commissioned portraiture through his website. We have a range of his off the cuff, titter-worthy cards, LGBT Wedding cards as well as a few of the Coggington series. Meet Catherine Bhogal from Abercarn. The artist behind 'Cwtch My Art.' Her work is inspired by the land and nature that surrounds her. We are proud to stock her range of bespoke designed product led cards. Click the link above to view her full range of products. Although it was my intention to create beautiful, reloved furniture masterpieces, all my time seems to be taken with the running of the gift side of the shop. Lilly-Mo's of Abertillery and Ebbw Vale has many years experience in furniture re-upholstery and repainting so it only made sense to put her beautiful products in store too! Traditional to quirky, we have it all. Eclectica started through a lack of space in a terraced house for Hanna to work on her upcycling furniture projects. She rented the shop as a workspace and didn't want the extra room to go to waste. She felt that Crumlin was a sorry town and needed something fresh and funky to perk it up. What better way than to open a unique card and gift shop sourced by UK based small business owners? We love the #Buylocal ethos, hence sourcing from the UK, and community is very close to our heart. We believe in supporting each other instead of competing with each other and have grown to be a positive little network. If you would like to be a stockist please Contact Us. ​Our aim is to have three more stores in 5 years...Abergavenny, Cwmbran and Porthcawl. So stay tuned!